Featuring IPMI 2.0 Server Remote Management with KVM-Over-LAN.IPMI (Intelligent Platform Management Interface) is a hardware-level interface specification that defines a common, abstract message-based interface to platform monitoring and control functions. Providing peace of mind to customers, SIM (Supermicro Intelligent Management) module implements IPMI 2.0 technology to provide remote access, monitoring and administration for Supermicro server platforms. With SIM, server administrators can view a servers hardware status remotely, receive an alarm automatically if a failure occurs, and power cycle a system that is non-responsive. (How does it work)-IPMI defines the protocols used for interfacing with an embedded service processor. This service processor - also known as Baseboard Management Controller (BMC) - resides on a server motherboard or in the chassis of a blade server or telecom platform. The BMC links to a main processor and other onboard elements via a simple serial bus. 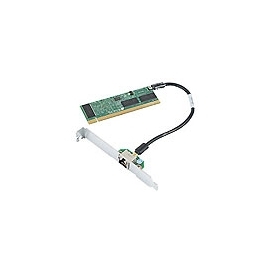 (What does it do)- Supermicro Intelligent Management (SIM) module monitors onboard instrumentation such as temperature sensors, power status, voltages and fan speed, and provides remote power control capabilities to reboot and/or reset the server. It also includes remote access to the BIOS configuration and operating system console information via SOL (Serial over LAN) or embedded KVM capabilities. Because the controller is a separate processor, the monitoring and control functions work regardless of CPU operation or system power-on status.